As Guerrilla 1 touched my skin I immediately wondered WTF was going on. A bizarre effect that smells something like a plastic bag containing overripe fruits, some flowers, a WEIRD raw meat accord and the typical synthetic/resinous vibe of many of the CDG's creations. It sounds horrifying but the overall effect is at the same time odd, intriguing and compelling. The drydown occours quite soon and reveals a more "conventional fragrance" (probably not the most appropriate definition talking about Guerrilla1) that stays close to the skin with a great blend of vetiver, musk and spicy hints. 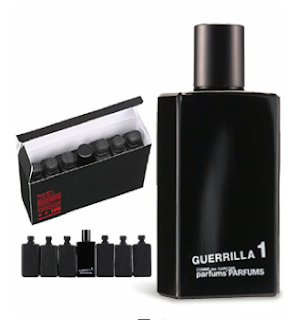 In this phase Guerrilla 1 smells something like a dirty musk for lubricated and polished androids. Unique and hyper-modern. 1) If you're looking for something unique, bizarre and challenging keep in mind that Comme Des Garcons is one of the very few outfits that is still able to create compositions that are at the same time weird, interesting and wearable mantaining a perfect balance between these characteristics. 2) Don't test Guerrilla 1 on paper as it's completely another scent, and a very disgusting one!